Opening Reception: May 8th, 6–8 p.m. 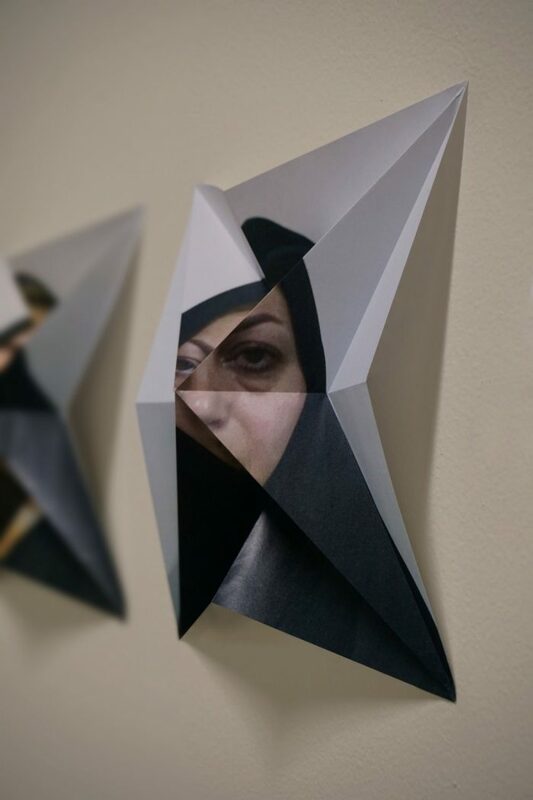 The College of the Arts and Department of Art and Design are proud to present the MFA Studio Art Thesis Show, a culminating exhibition featuring works produced by students graduating from the Master of Fine Arts (MFA) in Studio Arts program. The exhibition is curated by Isin Onol, the MFA program’s 2017-18 visiting critic, and assistant professor Chelsea Knight. The process of studying for a Master of Fine Arts degree, and in particular the preparation for an MFA graduation exhibition often opens up new dimensions for unexpected encounters as well as for a confrontation with oneself: Making it all the way to graduation requires both, a constant battle and a tenacious collaboration with oneself. A battle, in order to be able to push oneself beyond one’s previous boundaries and unlock a new phase in artistic production. A collaboration, to be able to remain productive during this battle, and despite the challenges, meet the deadlines and to allow oneself the pleasure of success. Only after leaving this process behind, the true meaning of all this hassle starts to reveal itself: The process of developing the graduation work is a unique experience that of looking deeply into one’s own eyes. Unveiling the work marks the moment of embarking on an artistic life on one’s own. 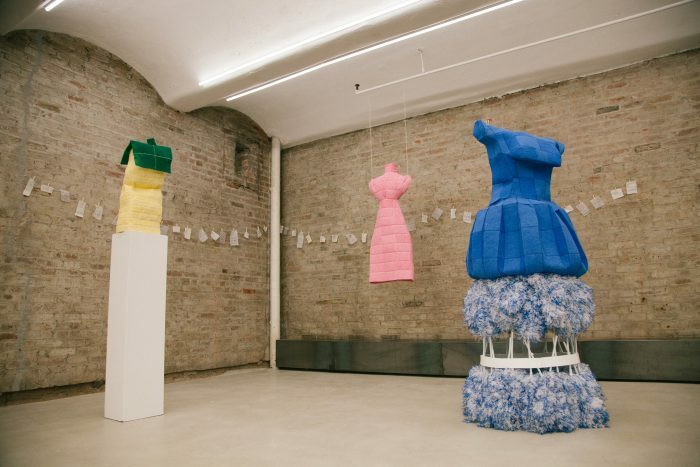 The exhibition “Fragility of _kin”— the title having been chosen by the artists themselves—brings together selected works by eleven emerging artists: This year’s MFA graduates from Montclair State University. It has been my privilege to work with the artists as a visiting critic over the past academic year, during which I have become closely familiar with an incredibly diverse set of thought and production processes. Independent from one another and yet mutually interlinked, each artist took a self-reflexive, self-referential position and focused on their singular journeys, pasts, and memories. One’s own history can be the safest place to take shelter in, but may also become the most fragile point of reference, since departing from it requires nothing less than revealing, analyzing, and critiquing the own self. Amira Ahmad, inspired by a deep longing for her home country of Egypt, presents a poetic response to Arabic calligraphy. 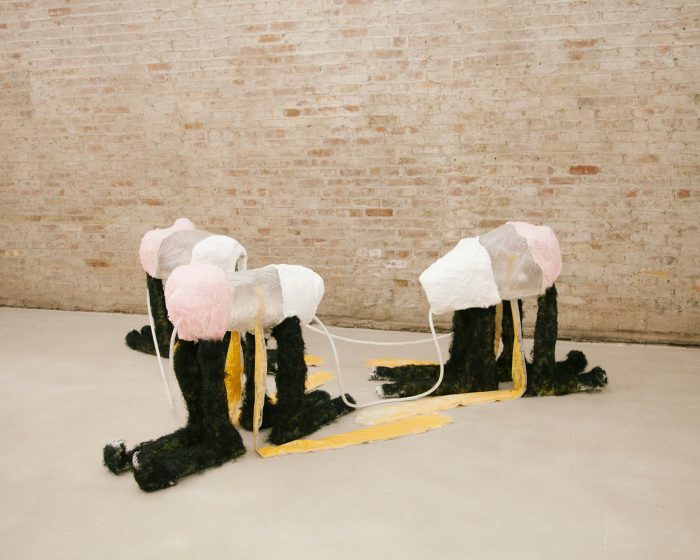 The visually appealing and decorative appearance of her work initially almost conceals the contents of the text, which tells of her personal struggle towards a form of self-expression. She explores the visual and contextual aspects of the art of calligraphy that employs text and image as a unified body. While on the one hand she deconstructs the notion of calligraphy through her abstraction, on the other hand she develops a new form of drawing by means of using calligraphy. A skillfully hidden poetic text silently shouts for a possible communication about the intimate. Afsane Barati’s work departs from her childhood experience of war in Iran and her response to it at the time. Her work is the result of her quest for expression of this particular traumatic experience from today’s point of view. Being physically distant from her home country, Afsane aims at expressing collective traumatic memories and their suppression together with her own optimistic attitude towards a better future and finds a means for doing so in a form of nostalgic language towards her past. Nadia Estela’s departure from personal and family history lead her into an in-depth research about migration, its reasons and effects. In her own words, her research asks about “the journeys we have made collectively and individually; how we navigate our social and cultural capital; how have we arrived here; what the implications of our biases are; how we profit from those imbalances; and how all these strata make a whole or keep it separate.” Through her artistic research Nadia developed a distinctive visual language that communicates her concerns, questions, and memories integrated into the larger concepts she is dealing with. Alexandra Luca’s work is perhaps the most apparent example of a rigorously self-reflexive and self-referential approach: Alexandra places her life, her body, and her psyche under relentless scrutiny and produces her performative work based on the results of this process. 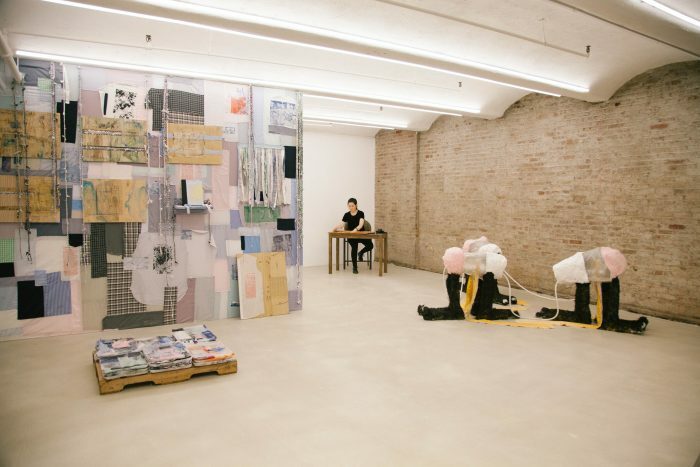 Her bodily, psychological, and intellectual responses to her sincerely posed questions inform and structure her work. Alexandra straightforwardly summarizes her quest: “I seek to make my private world visible by investigating the beginning stages as well as the contemporary state of my existence.” The process that Alexandra has chosen to go through during production of her MFA thesis not only lead her to new encounters with herself, but also enabled her to develop a new personal artistic language. Stephanie Santiago followed a different but similarly challenging path in examining her existence in society, and her position in the spectrum of femininity and gender fluidity. Analyzing her own life, body, and experiences, she researches about the “ownership of the female body and how this ownership constrains female femininity”. 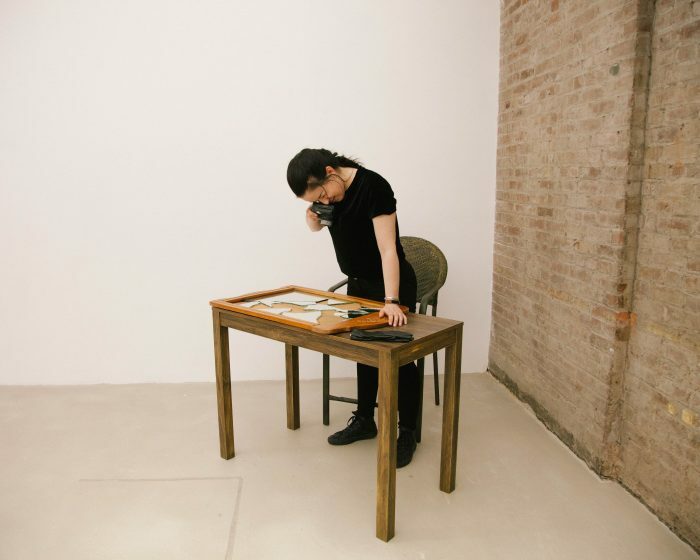 “Most importantly”, Stephanie explains, “my work seeks to create a conversation on the idea of understanding the spectrum and multidimensionality of gender and sexuality.” By keeping her own body and life as well as the people in her vicinity under permanent observation, Stephanie becomes the object of her own study. This allows here a new encounter with aspects of her identity while making them courageously visible to others at the same time. 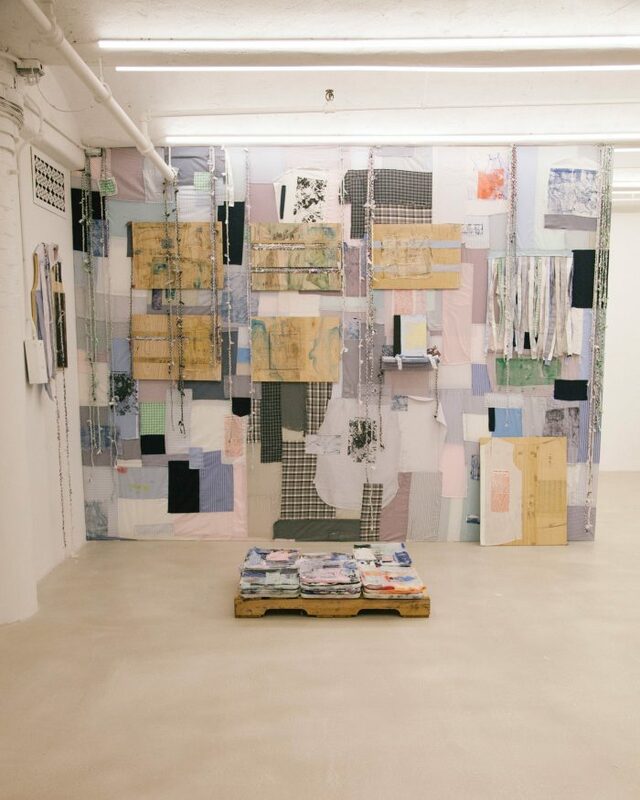 Having graduated with a BFA degree in 1977, Madeline Tolins-Schlitt unlocks a new phase in her art-making process by confronting but at the same time embracing her long-time artistic manners and practices. 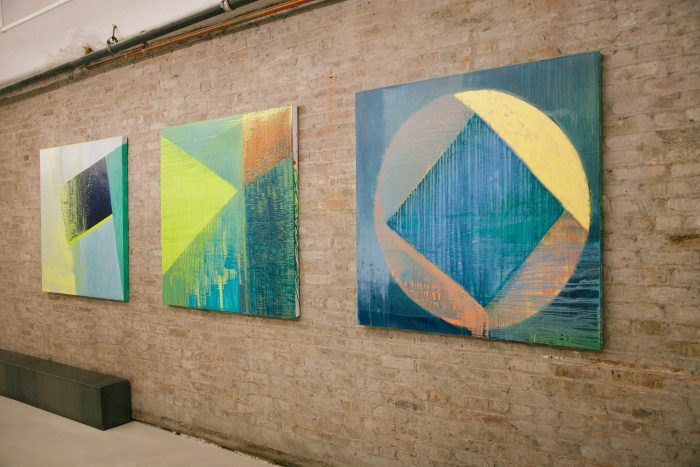 Her abstract, geometrical paintings are the results of her diligent research, as well as her sustained rigor in constructing the painted surface and in testing the medium that she employs. 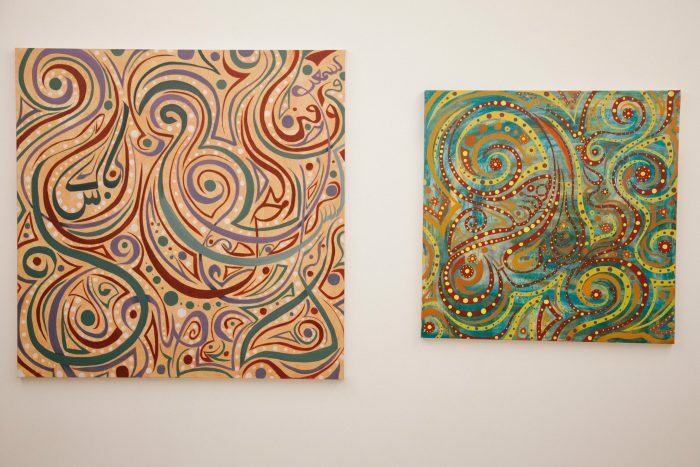 She often starts by creating a challenge on the canvas that she calls “chaos” and then undertakes to deduce from this challenge new creations and order. In a reversal of this strategy, she may also depart from rigid geometrical shapes that she deconstructs through the free flux of paint with gravity along the current orientation of the canvas. In her finished works, Madeline’s experience during the process of making a painting is visible in great detail. She works as if she were in a scientific lab, observing the outcomes of her experiments on the canvas, making new experiments with color field, texture and dimensionality. 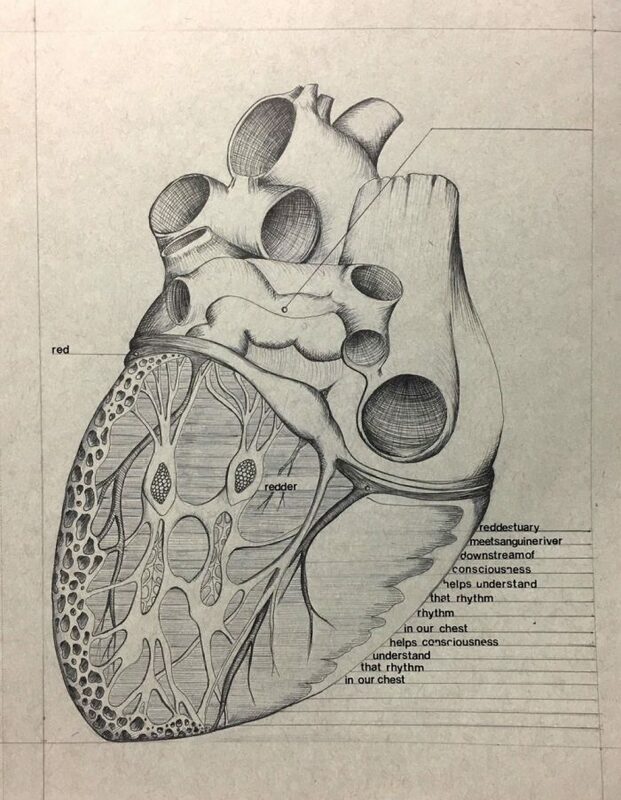 By creating a poetic anatomy drawing book Kevin Kolankowski reflects on his work as an art teacher: “This inter-relationship of disciplines looks to examine a composite picture of the world within its complex systems. I am most interested in the connection of seemingly disjoined pieces of the entire system of which we are a part, and finding points of intersection” explains Kevin. In the particular work shown, he brings together the aesthetic of an anatomy book and his own haiku poetry. Although at first glance, the result looks as if the anatomical drawings would have been copied from a medical textbook, labelled with the scientific names of the various components, upon closer examination it becomes apparent that the unique drawings created by the artist are accompanied by and related to his poetry. Imani Richardson creates a metaphorical connection between the exploitation of mules and the condition of Black women in America. “The mule was bred for the sole purpose of performing labor” explains Imani, “like the mule, Black women were brought to America and forced to mate to further populate and produce more laborers.” Imani focuses on the medical exploitation of the Black women as well as their physical labor and compares both aspects with the mules who had to carry the load and were bred for that purpose. 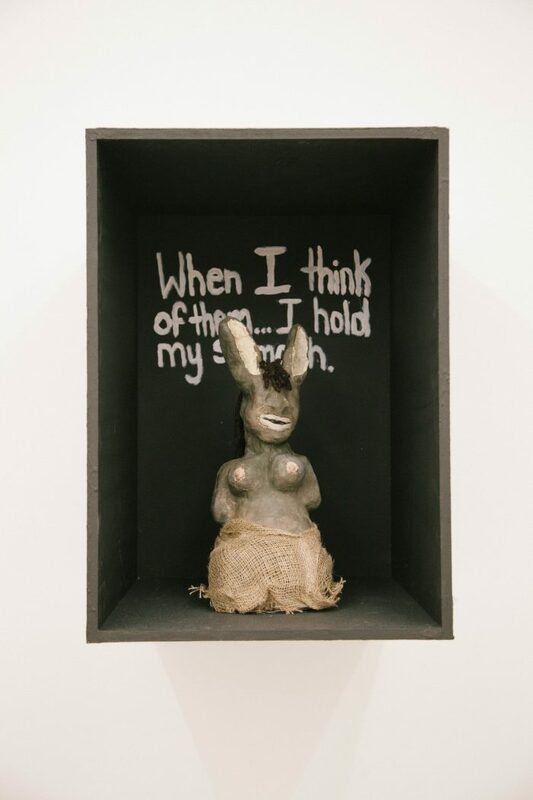 To point out the uncanny facts that are still in the shadow of history—or worse, still the case today—Imani creates sculptures that are mutant mixtures of mules and black women, which she consciously leaves in the dark, making them almost invisible to the audience. Tracey Di Tolla reflects on the disturbing experiences that the violent narrative imagery of the Catholic tradition created during her childhood, and represents them from today’s point of view. Starting from the imagery of church settings and direct connections with selected objects, Tracey has been experimenting with creating imaginary spaces in which uncanny incidents occur. 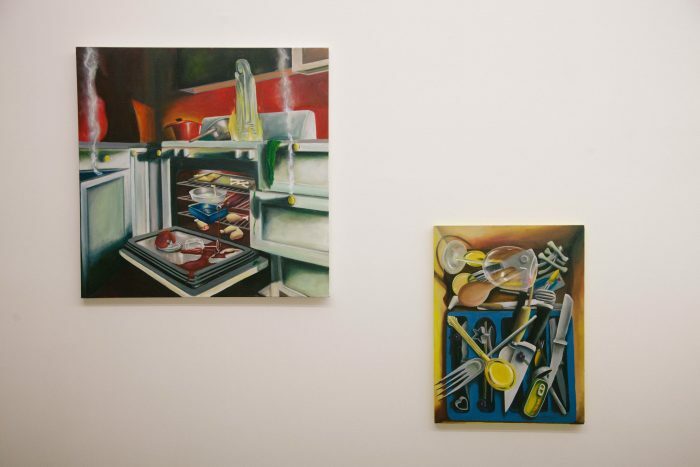 Recently, she moved the setting of her paintings to her domestic space, primarily to kitchen, a space commonly associated with the feminine. Her criticism of the traumatic impact of religious imagery is very gentle and almost invisible. In recreating her childhood perceptions of religious spaces, narratives and objects, Tracey creates a playful setting that only on closer examination reveal the mysterious and disturbing imagery from which it is constructed.